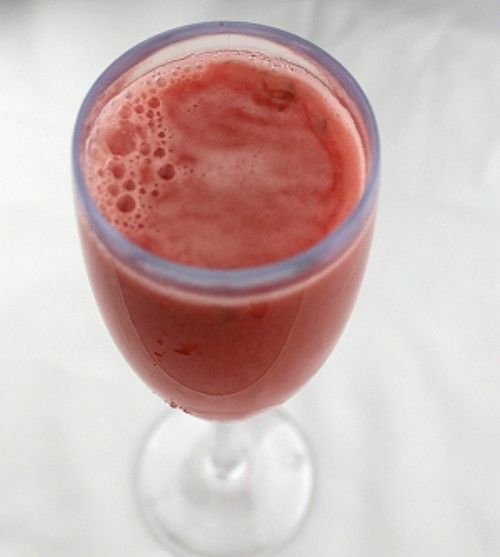 The Love Cocktail has a slightly creamy, thick texture that comes from blending raspberries and egg white with the other ingredients. The flavor here is berry with a touch of lemon. The egg white counteracts the cloying sweetness of the sloe gin somewhat, but it’s still a very sweet, fruity cocktail. It’s a terrific dessert substitute, with the egg white even making it a tiny bit filling. This is a very fun drink. Pour everything into a blender and blend until it’s smooth and thoroughly mixed. Pour it into a champagne flute.